“I enjoyed the horses very much. 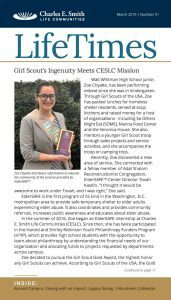 It was a great experience for me,” said a Hebrew Home of Greater Washington resident. 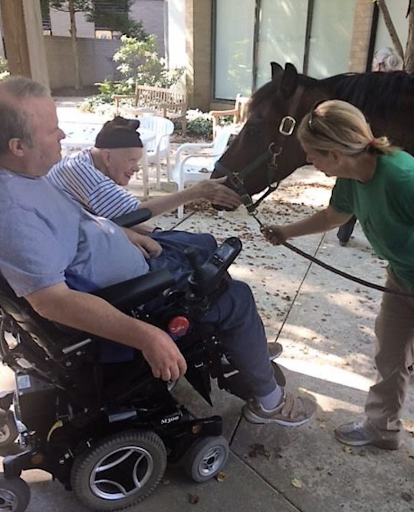 This past summer, Hebrew Home of Greater Washington residents participated in an innovative and exciting equine-assisted therapy pilot program. The pilot program was made possible through a generous gift from Rena Dweck to honor the memory of the family’s beloved sister and aunt, Harriet Nahum. Animal Assisted Therapy (AAT) is a type of medical approach that integrates animals into the treatment process to promote mental and physical wellness and improve overall quality of life.1 Equine-assisted therapy, a form of AAT that utilizes horses, is a strategy that incorporates different types of activities, including: selecting a horse with which to interact, groom, walk and even play games. Horses offer an advantage because research suggests that these animals are quite sensitive to human body language and emotions. Research suggests that incorporating horses into therapy provides older adults with a greater ability to live fully in the here-and-now.3 Often mirroring emotions and the physical demeanor of people who engage with them, horses provide opportunities to boost awareness about certain behaviors and may even help lessen the effects of anxiety, autism, PTSD and pain. Horses have long shared a special bond with people and a special place in our history. There is no question about our attachment to these animals. Some of the earliest references exalt these unique and symbiotic relationships, especially as they apply to mental and physical health. The therapeutic benefits of horseback riding have a long history. For example, in the fifth century BC, the Greek physician Hippocrates referenced the value of horseback riding and horses in a treatise entitled ‘Natural Exercise’4. The power of these relationships has encouraged medical experts to more fully embrace the benefits of AAT with important significance for older adults. 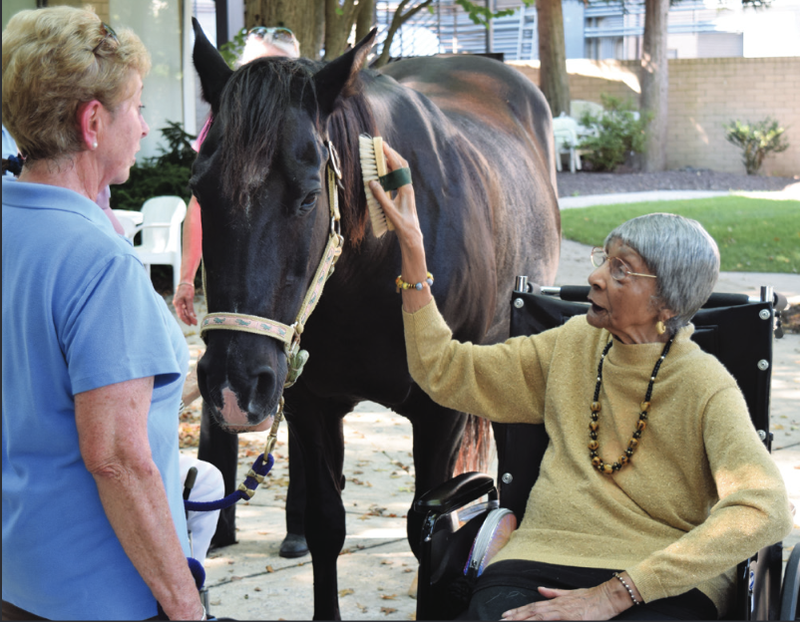 that visited campus as part of equine-assisted therapy. Relief of boredom, reduced loneliness. Relaxation and improved vital signs (e.g. lowered blood pressure and other physiological signs of stress). A greater interest in physical activities. “Residents who have memory loss may all of a sudden start talking about pets and experience they had as children,” said Hebrew Home of Greater Washington Director of Recreational Therapy Kayla Kitchmaster. This is an important key to the success of these programs. 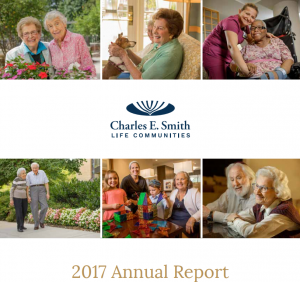 Many older adults have lifelong memories and emotional attachments to pets they had in their early childhood. Re-introducing an animal later in life may help stimulate those wonderful memories. In addition to last summer’s equine program, CESLC also partnered with Quiver Farm. The farm brought chicken and duck eggs for hatching to Smith-Kogod, Wasserman and Revitz residences. Residents watched the ducklings and chicks hatch. 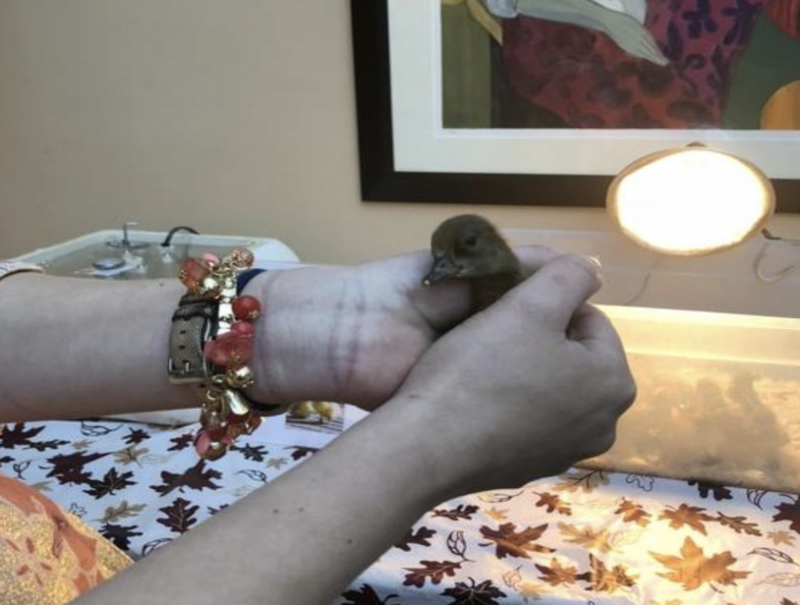 CESLC residences housed 31 chicks and ducklings who hatched on campus. Enjoying these special moments provided a wonderful experience for residents and their visiting families. Dabelko-Schoeny H, Phillips G, Darrough E, DeAnna S, Jarden M, Johnson D, Lorch G. Sankey C, Richard-Yris MA, Leroy H, Henry S, Hausberger M. Positive interactions leading to positive memories in horses, Equs caballus. Animal Behavior. 2010;79:869-875.